Editor’s note: We thought you’d enjoy seeing this article from this past summer’s issue of The Timber Crier, the New Hampshire Timberland Owners Association‘s magazine. The article provides a good overview of the history and current operation of the Randolph Community Forest. It is reprinted with permission. The town of Randolph, N.H., is in a part of Coὂs County that sees a lot of through traffic. Crossing the southern edge of the town on U.S. Route 2, the climb up “Gorham Hill” gives the traveler a quick glimpse of Randolph’s 350 residents. If you are heading east up Gorham Hill and take a left on Randolph Hill Road, you will run smack dab into one of the largest community-owned forests in the United States – the 10,000-acre Randolph Community Forest. The person who knows the history of the Randolph Town Forest the best is New Hampshire Timberland Owners Association (NHTOA) member and retired New Hampshire State Trooper John Scarinza. John was instrumental in helping raise both community awareness and money to help the town purchase the 10,000 acres from its former owner, Hancock Timber Resource Group. 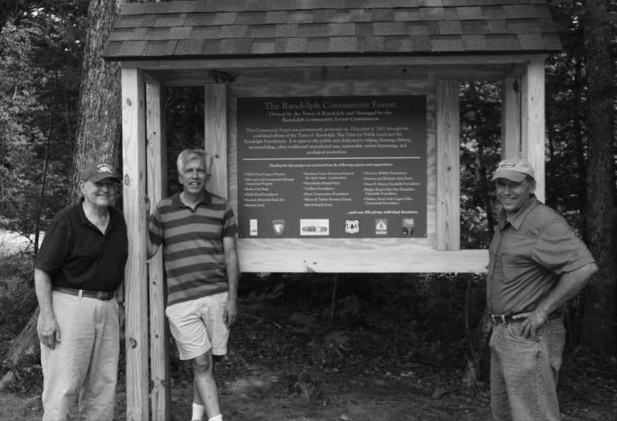 He was part of a dedicated group of three – including fellow Randolph Planning Board member David Willcox and Appalachian Mountain Club Deputy Director Walter Graff – that worked tirelessly between 1995 and 2001 to make the Randolph Community Forest a reality. “We kept the core group small so we could work efficiently. But we did a whole lot of listening to local residents who wanted to keep the forest a working landscape,” John said. This forest was permanently protected on Dec. 4, 2001, through a U.S. Department of Agriculture Forest Legacy conservation easement. This easement was the product of a broad coalition of more than 200 conservation groups, land trusts, individual donors, and members of the local community. A core tenet of the easement and mission of the Randolph Community Forest is public access for a multitude of recreational activities. The Randolph Mountain Club, of which John is current president, maintains 20 miles of trails on the Randolph Community Forest. Hiking, bird watching, and berry picking are all encouraged on the miles of forest trails. In the winter, three snowmobile clubs maintain trails on the forest. An informal group, known as the Randolph Society for the Advancement of Backcountry Skiing, maintains several challenging backcountry ski routes on this community forest. David Willcox, left, Walter Graff, and John Scarinza were at the core of the effort to purchase and place a conservation easement on the land that is now the Randolph Town Forest. Photo courtesy of Jenn Barton. The backdrop to all this recreational activity is that the Randolph Community Forest is still very much a working forest. Working with the Randolph Community Forest’s forester, Walt Winturri, NHTOA member and N.H. licensed forester, five commercial timber harvests have been conducted on the Randolph Community Forest in the past 12 years. These harvests produced 674,000 board feet of hardwood saw timber, 6,787 cords of hardwood pulp, and 10,906 tons of hardwood chips. These harvests generated more than $500,000 in stumpage payments to the Town Forest Revolving Fund, which is administered by the Forest Commission. The Town Forest Commission was established in 2001 to oversee the management of the Randolph Community Forest. “If we can support the working forest landscape, improve wildlife habitat, promote recreation, and make some money for the stewardship of the forest, then I think we have managed the forest well,” John noted. Some restrictions, usually temporary, may apply in the interests of carrying out other management goals, which include sustainable timber harvesting, the enhancement of wildlife habitat, and the protection of natural areas. For John, it has been very gratifying to see the impact that the Randolph Community Forest has had on many areas of life in this small Coὂs County town. This year’s Community Forest Field Day is Saturday, August 3rd. The meeting will begin at 9 a.m. with a presentation at Randolph Town Hall. For more information, check the Community Forest’s Website. For his efforts, John was recognized in 2003 with the Steward of the North Country Working Landscape Award from the North Country Resource Conservation and Development Area Council.